• Sculpting with Super Sculpey: "The Orxplorer"
The Orxplorer is a sculpt that I've had in mind for quite a long time. The idea behind the sculpt was to get the same feel and look as my Ork Metaljaw sculpt while still keeping it unique and personal! The first idea I built the sculpt around is the "glass eye" that sits on a strap that goes around the face. I had a good idea of how I wanted the orxplorer to look like before starting it, thus I made a sketch of the finished look. I still changed some things during the process, to achieve a better end result. Sometimes, what you think will look good sculpted might not look like you thought. 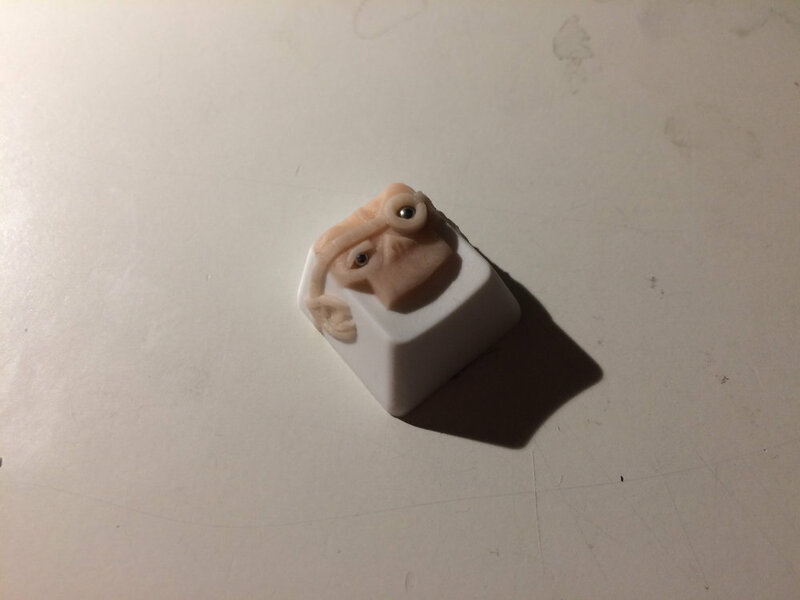 Just a rough sketch, metal bearings, a keycap and some super sculpey clay was the only things needed to complete this sculpt. One thing that it very important to think about when making a coherent sculpt is to try to incorporate the figure into the cap, instead of making a figure that is sitting on top. In this case, I made the upper part of the head first, with the nose sticking out and with the two metal balls set into place. After that I added what sticks out of the cap; eyebrow, glass-eye, leatherstraps and ears. When I was sattisfied with this upper part I cured it in the oven for 15 minutes before continuing. This is one of the biggest advantages of Super Sculpey, or Polymer Clays as a whole. 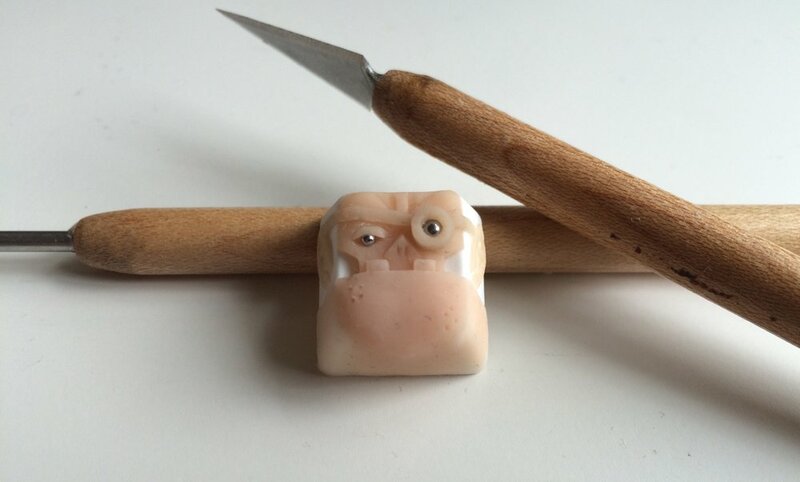 Having one part of the sculpt already cured removes the worries of damaging it, and moves your focus 100% towards the parts you're currently working on. If you are interested of the process of how I went about casting this 5-shot cap, a full walkthrough can be found under Casting: Multishotting Tutorial. that guide shows every step that I took to cast the cap, from start to finish! So this is the end of this first sculpting showcase-tutorial-ish thingy, hope you enjoyed it and/ or learned something from it!